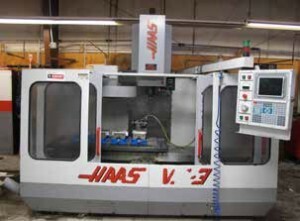 AUCTION DATE: TUESDAY SEPTEMBER 29, 2015 @ 10:30 A.M.
1995 Haas VF-3 CNC Vertical Machining Center s/n 4521 w/ Haas Controls, 20-Station ATC, CAT-40 Taper Spindle, 7500 RPM, 15Hp High Torque Motor, Rogid Tapping, Programmable Coolant Nozzle, New Spindle Controller. 1985 Tree / KIRA mdl. CNC200 CNC Vertical Machining Center s/n 60022 w/ Fanuc Series 10M Controls, 20-Station ATC, CAT-40 Taper Spindle, 6500 RPM 15Hp Motor, M-Function 4th Axis, 16 ½” x 25 ½” x 20” Travels, Coolant. 10” 3-Jaw Power Chuck, Omnibar mdl. 65PA Automatic Bar Feed. 1986 Okuma LB12 CNC Turning Center s/n 9132 w/Okuma OSP500L-G Controls, 3500 RPM, 8-Station Turret, Hydraulic Tailstock, 8” 3-Jaw Power Chuck. 1986 Okuma LB12 CNC Turning Center s/n 0854 w/Okuma OSP500L-G Controls, 3500 RPM, 8-Station Turret, Hydraulic Tailstock, 8” 3-Jaw Power Chuck. mdl. 34PA Automatic Dampening Bar Feed. Second OP Clutch, Self Feeder. (1 of 3) Traub mdl. A25 1” Cap. Automatic Screw Machines w/ Cross Slides, Drill Station. Table. (0057) Weiler Second OP Lathe w/ 125-2800 RPM, 6-Station, Turret, Cross Slide, 5C Pneumatic Collet Closer. Boyar Schultz Challenger 612 6” x 12” Surface Grinder w/ Walker Electromagnetic Chuck. Burr King mdl. 760 1 ½” Belt Sander. (0020) Lista cabinets with tooling. Partial view of CT-40 tool holders. Blackhawk mdl. AP-12 12 Ton Hydraulic H-Frame Press. (2)Rockwell Bench Model Drill Presses. CTD 12” Abrasive Cutoff Saw. (2) Haas and Yuasa Brushed 4th-Axis 5C Rotary Heads. (2) Huot Toolscoot Taper Tooling Carts. (2) Toolex Teco 6” Double-Lock Vises. 6” 2-Jaw Power Chuck (Okuma LB10). Insert Turning, Threading, Grooving and Boring Tooling w/ Carbide Inserts. Traub Screw Machine Collets and Tooling. Warner & Swasey No. 5, No. 4, No. 3 Collet Pad Sets and Jaw Adaptors. (3) Tapmatic and Procunier Tapping Heads. 8” x10” Compound Angle Plate. (2)Huot Drill Cabinets Metric and Frac-Ltr-Num. Drills, Taps, Reamers, Endmills Knurling Tools, and Perishable Tooling. Dake No. 0 Arbor Press. J & L mdl. T-10 10” Table Model Optical Comparator w/ 10X, 20X and 50X Lenses. (0053) Wilson Rockwell Hardness Tester. Mitutoyo 0-12” OD Mic Set. Scherr Tumico 18” Vernier Height Gage. (4) Teclock Dial Bore Gages to 6”. Mitutoyo 2”-3”, 1”-2” 0-1” Thread Pitch Mics. Starrett 48” and 24” Vernier Calipers. Pin Gage Sets to 1.000”. 18” x 24” x 4” Granite Surface Plate.